The Universal Rocket or UR family of missiles and carrier rockets is a Russian, previously Soviet rocket family. Intended to allow the same technology to be used in all Soviet rockets, the UR is produced by the Khrunichev State Research and Production Space Center. Several variants were originally planned, of which only three flew, and only two of which entered service. In addition, the cancelled UR-500 ICBM formed the basis for the Proton carrier rocket. A rocket is a missile, spacecraft, aircraft or other vehicle that obtains thrust from a rocket engine. Rocket engine exhaust is formed entirely from propellant carried within the rocket before use. Rocket engines work by action and reaction and push rockets forward simply by expelling their exhaust in the opposite direction at high speed, and can therefore work in the vacuum of space. The Proton was a model of Soviet Earth observation satellites. The maximum mass was about 17 tonnes. Four Proton satellites were launched between 1965 and 1968. The satellite was developed by NPO Mashinostroyeniya. The aim of the project was to study high and ultra-high energy particles. A Low Earth Orbit (LEO) is an Earth-centered orbit with an altitude of 2,000 km (1,200 mi) or less, or with at least 11.25 periods per day and an eccentricity less than 0.25. Most of the manmade objects in space are in LEO. A histogram of the mean motion of the cataloged objects shows that the number of objects drops significantly beyond 11.25. Private spaceflight is flight beyond the Kármán line —or the development of new spaceflight technology—that is conducted and paid for by an entity other than a government agency. Heavy ICBM is a term that was created in the 1970s to describe a class of Soviet and Russian ICBMs. They were characterized by a heavy throw-weight of 5 to 9 metric tons, several times that of an LGM-30 Minuteman, and a length of over 35 meters, and were thus capable of delivering a large number of warheads in a single MIRV missile. TNT equivalent is a convention for expressing energy, typically used to describe the energy released in an explosion. The "ton of TNT" is a unit of energy defined by that convention to be 4.184 gigajoules, which is the approximate energy released in the detonation of a metric ton of TNT. In other words, for each gram of TNT exploded, 4,184 joules of energy are released. A thermonuclear weapon, or fusion weapon, is a second-generation nuclear weapon design which affords vastly greater destructive power than first-generation atomic bombs. Modern fusion weapons consist essentially of two main components: a nuclear fission primary stage and a separate nuclear fusion secondary stage containing thermonuclear fuel: the heavy hydrogen isotopes deuterium and tritium, or in modern weapons lithium deuteride. For this reason, thermonuclear weapons are often colloquially called hydrogen bombs or H-bombs. The (GRAU index) 8K82K version is now usually called "Proton K". It is fuelled by very toxic unsymmetrical dimethyl hydrazine and nitrogen tetroxide. These are hypergolic fuels which ignite on contact, avoiding the need for an ignition system, and can be stored at ambient temperatures. 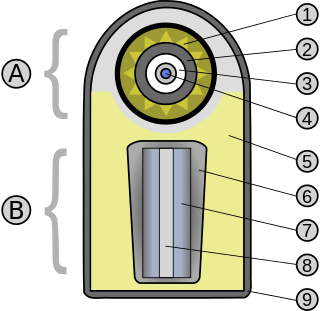 This avoids the need for components that are tolerant of low temperatures, and allows the rocket to remain on the pad indefinitely (other launchers with such capability include the U.S. Titan II, Titan III, and Titan IV, the Chinese Long March 2 rocket family and Long March 4 rocket family, the Soviet/Ukrainian Tsyklon launchers, the Soviet/Russian Kosmos-3 and Kosmos-3M launchers and the European Ariane 1 to Ariane 4 launchers). In contrast, cryogenic fuels need periodic replenishment as they boil off. The Proton M's improvements included lower stage modifications to reduce structural mass, increase thrust, and fully use propellants. Generally a Briz-M (Russian : Бриз meaning Breeze) storable propellant upper stage is used instead of the Blok D or Blok DM stage, removing the need for multiple fuel supplies and oxygen top-off due to boiling; the Proton-M also flew with a Blok-DM upper stage. Efforts were also made to reduce dependency on foreign (usually Ukrainian) component suppliers. On 6 August 2012, the Russian Federal Space Agency lost a Russian and an Indonesian communications satellite in an attempt to launch them into orbit on a Proton-M due to technical difficulties with the last stage. On 2 July 2013, a Proton-M launching three GLONASS navigation satellites experienced a failure reminiscent of the 1960s disasters shortly after liftoff when the booster crashed near LC-39 at Baikonour, ending a 30-year unbroken stretch without a first stage failure; all future Proton flights were suspended pending investigation. The accident was eventually determined to be caused by the rate gyro package having been installed upside-down. Due to the difficulty of installing the package incorrectly, it was widely suspected that it had been done deliberately by a disgruntled or drunk worker at the Khrunichev plant. Energia was a Soviet rocket that was designed by NPO Energia to serve as a heavy-lift partially recoverable launch system for a variety of payloads including the Buran spacecraft. Control system main developer enterprise was the Khartron NPO "Electropribor". The Energia used four strap-on boosters each powered by a four-chamber RD-170 engine burning kerosene/LOX, and a central core stage with 4 one-chamber RD-0120 (11D122) engines fueled by liquid hydrogen/LOX. International Launch Services (ILS) is a joint venture with exclusive rights to the worldwide sale of commercial Angara and Proton rocket launch services. Proton launches take place at the Baikonur Cosmodrome in Kazakhstan while Angara is planned to launch from the Plesetsk and Vostochny Cosmodromes in Russia. The Nimiq satellites are a Canadian fleet of geostationary telecommunications satellites owned by Telesat and used by satellite television providers including Bell TV and EchoStar. 'Nimiq' is an Inuit word used for an object or a force which binds things together. A contest in 1998 was held to choose the name of these satellites. The contest drew over 36,000 entries. Rokot, also transliterated Rockot, is a Russian space launch vehicle that can launch a payload of 1,950 kilograms into a 200 kilometre Earth orbit with 63° inclination. It is a derivative of the UR-100N intercontinental ballistic missile (ICBM), supplied and operated by Eurockot Launch Services. The first launches started in the 1990s from Baikonur Cosmodrome out of a silo. Later commercial launches commenced from Plesetsk Cosmodrome using a launch ramp specially rebuilt from one for the Kosmos-3M rocket. The cost of the launcher itself was about 15 million in 1999; The Eurockot contract with ESA for launching Swarm in September 2013 was worth €27.1 million. Blok D is an upper stage used on Soviet and later Russian expendable launch systems, including the N1, Proton-K and Zenit. The Briz-K, Briz-KM and Briz-M are Russian liquid-propellant rocket orbit insertion upper stages manufactured by Khrunichev State Research and Production Space Center and used on the Proton-M, Angara A5 or Rokot, one of Russia's smaller launchers. The Proton-M, (Протон-М) GRAU index 8K82M or 8K82KM, is a Russian heavy-lift launch vehicle derived from the Soviet-developed Proton. It is built by Khrunichev, and launched from sites 81 and 200 at the Baikonur Cosmodrome in Kazakhstan. Commercial launches are marketed by International Launch Services (ILS), and generally use Site 200/39. The first Proton-M launch occurred on 7 April 2001. The KVTK (Russian: Кислородно-водородный тяжёлого класса, Oxygen/Hydrogen Heavy Class) is a liquid oxygen/hydrogen upper stage for high energy orbits. The KVTK contains an RD-0146D engine and is designed for use on Angara rockets. KVTK would be the first hydrogen-powered upper stage for use on a Russian launch vehicle, although Khrunichev has previously produced a hydrogen-powered upper stage (KVD-1) for the Indian GSLV. KVTK is designed to provide up to five ignitions, allowing for complex orbital maneuvering, and have an on-orbit lifespan of up to nine hours. KVTK would allow an increase in payload to GTO of 20-50% compared to the Angara A5's standard Briz-M upper stage, powered by UDMH and N2O4. Ekspress MD2 is a Russian communications satellite which was lost due to a launch failure on 6 August 2012. Equipped with eight C band transponders and one L band transponder, it was intended to be located in geostationary orbit at a longitude of 145° east. It was the second Ekspress MD satellite to be launched, following Ekspress MD1 in 2009. The S5.98M, also known as the 14D30, is a Russian rocket engine, currently powering the Briz upper stages. It was designed by KB KhIMMASH, the famous Isaev designed bureau, and it burns UDMH and nitrogen tetroxide in a gas-generator cycle. The Blok DM-03, GRAU index 11S861-03, is a Russian upper stage used as an optional fourth stage on the Proton-M carrier rocket. Three have been launched, the first in December 2010; the first two launches failed before fourth stage ignition, the first as a result of a problem with the Blok DM's fuel load. The flight of Angara-1.2pp was the maiden flight of Russia's Angara series of rockets. This flight was conducted successfully on 9 July 2014. A unique configuration with parts taken from the Angara-1 and Angara-A5 rockets, the suborbital mission served to flight test each of the new stages developed for the rocket ahead of its operational use. Yamal is a communication and broadcasting system developed and operated by Gazprom Space Systems. Born out of the connectivity needs of the natural gas extraction giant Gazprom, the system was spun off in its own company, and opened the network to third parties and even went into the public broadcasting industry. Yamal and RSCC's Ekspress constellation are the only two national satellite operators in Russia. Irtysh, formerly called Soyuz-5, codenamed Fenix in Russian and Sunkar, is a planned Russian rocket that is being developed by JSC SRC Progress within the Project Feniks. Initially it will replace the capability of Zenit-2, and Proton Medium, and in the future will serve as the base of a super heavy-lift launch vehicle rocket to revive the Energia/Buran capabilities. It is expected to launch from the Baikonur Baiterek, the ex Zenit-2 launch site, in a partnership with the government of Kazakhstan, with a planned debut of 2022. ↑ "Proton Mission Planner's Guide". International Launch Services. ↑ "Proton Verticalization, Pad 39, Baikonur". flickr. 5 September 2005. ↑ Clark, Stephen (June 9, 2016). "Upgraded Proton booster adds satellite to Intelsat's fleet". Spaceflightnow.com. ↑ "Commercial Launch Heritage". International Launch Services. ↑ "Russian rocket development in the 2010s". Anatoly Zak. 1 2 Berger, Eric (25 June 2018). "Russia's Proton rocket, which predates Apollo, will finally stop flying Technical problems, rise of SpaceX are contributing factors". arsTechica. Retrieved 2018-06-26. ...failures have followed in recent years. These problems, combined with the rapid rise of low-cost alternatives such as SpaceX's Falcon 9 rocket, have caused the number of Proton launches in a given year to dwindle from eight or so to just one or two. ↑ "Proton Heritage". International Launch Services. ↑ "Proton Launch Archives | International Launch Services". ilslaunch.com. Retrieved 13 September 2014. ↑ Statement by Vladimir Ye. Nesterov, Khrunichev Director-General, at Press Conference on 15 July 2010 Khruhichev 29 July 2010. ↑ "Russia's Proton rocket grounded by poor quality control". www.planetary.org. Retrieved 2017-01-26. ↑ "Russia's Proton Rocket faces extended Grounding due to systemic Engine Problems". spaceflight101.com. Retrieved 2017-02-24. ↑ "Commercial Launch Vehicle | ILS Proton Breeze M | International Launch Services". ilslaunch.com. Retrieved 13 September 2014. ↑ "Experience ILS: Achieve Your Mission" (PDF). 4 March 2011. Retrieved 13 September 2014. ↑ "News from around the world". latimesblogs.latimes.com. Retrieved 13 September 2014. ↑ "Russia's Proton crashes with a trio of navigation satellites". Russian Space Web. 2 July 2013. ↑ "Commercial Launch Heritage | Proton Rocket | International Launch Services". ilslaunch.com. Retrieved 13 September 2014.